In my own words: Bloggus Interruptus! We interrupt this challenge due to a grievous error in craft/fashion/repurposing judgement. I made a wee little mistake. Here we go, from the top. Recently I bought a yellow necklace and later, a yellow belt. I love yellow! So what final accessory do I need in yellow? Shoes of course. So the first thing I did was look in my closet to see if there was a pair I could repurpose. And there were these little guys. Nothing special, but not hideous either. They are a good brown shoe, but I have another pair of brown flats that I like better so whenever I needed brown shoes, they won. I mentioned to my friend Kelly that I was considering spray painting some shoes yellow. She suggested I do teal or coral instead but yellow was good too. I had a vision you guys. 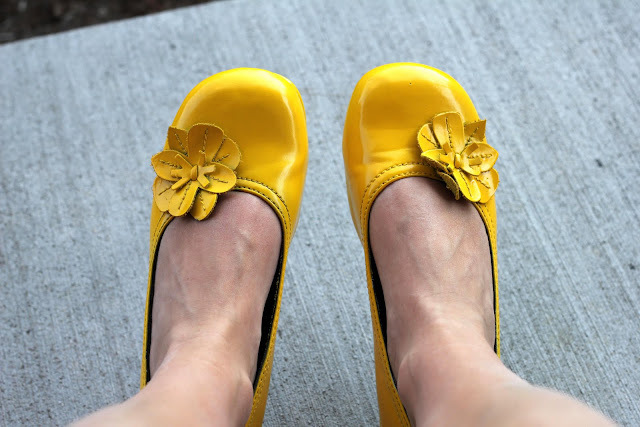 A vision of darling yellow shoes, a color of shoe I had never owned before. One that would create limitless combinations in my wardrobe. One that would make me look more interesting. Perhaps, one that would actually make me more interesting. Oh, are you reminding me of these shoes? Okay, yes. Those exist too. But gold glitter is not the same as yellow. Fine, I'll admit I was rethinking the yellow as I drove to the store to get paint. I do really like blue, maybe that? Or red? I don't have any red shoes (now that I covered them in gold glitter, ahem). And that teal idea is actually sounding really nice too. I went with the "vision"
Ugly ugly clown shoes. Not good. When I asked Tyson what I could do to help them he said make one into a bus. A bus! And on top of everything else they made my feet look hairier and my legs look fatter. And yet from certain angles they don't look sooo bad. Oh but they are, they really are. And the paint's already cracking. Should I not have spray painted shoes? Did everyone already know this? Stupid vision. So now what do I do with them? Trash? Fabric? Glitter? call me crazy-- but I actually like that color!!! Should have gone with the teal...LOL! Just kidding! Maybe repaint or fabric or glitter. Or paint remover and start over with a less "school bus yellow", more of a mustard perhaps. How do they make your feet look hairy? haha, that got me! Sell them on ebay with a link to your blog. I actually like them! Although, if they are cracking, that's no good. I have to confess, I was wondering as I read your blog, how many pairs of shoes you own in your closet. Isn't this at least the third pair you have re-purposed?! Ha ha, I have too many shoes! My problem is that I never throw anything away so if the shoe still fits, I still have it. I definitely have shoes from high school. I actually like the color. Wear them with a long pair of jeans; or a cute vintage skirt. Yeah, you can totally rock them. No good though if they're cracking though. Are your gold glitter shoes cracking? And I'm jealous you can still wear shoes from HS. I threw a lot of mine away (was into "tall" shoes) when I married a guy only 2 inches taller than me. AND, after 4 1/2 babies, my feet are 2 sizes BIGGER!! Whhaaa'?!! Hey Mari! Its Yuki, just wanted to let you know that I really enjoy reading your blog! Oh, and maybe repaint the shoes black and leave the flowers yellow? I love them! I want them! What brand of yellow did you use? If they are cracking- just add silver glitter!